In September 2015, when we published our first In the Weed(s) post about cannabis-related real estate, medical marijuana had been legalized in ten states (plus D.C.), five of which had also legalized cannabis for recreational use. Fast forward to today, and 30 states (plus D.C.) have enacted laws legalizing marijuana. Equally important, as of October 17th, Canada became the first industrialized country to legalize recreational and medical marijuana use. Throughout Canada and in each U.S. jurisdiction where cannabis has been legalized, real estate is a necessary common denominator for cannabis cultivation, transformation and retail distribution. In 2017, cannabis sales topped $9B in North America and according to a recent report by Grand View Research, Inc., annual global cannabis sales are expected to reach $146B by the end of 2025. If you're thinking this would be a great value creation opportunity for your property, keep in mind other post-2015 changes. Earlier this year, the Department of Justice rescinded Obama administration policies creating a safe harbor against enforcement of federal marijuana laws in states that have legalized marijuana. Thus there is no longer an official federal policy that protects against criminal federal prosecution for the use, possession, cultivation and transportation of marijuana notwithstanding compliance with state law. This potential for federal prosecution extends to a wide range of cannabis-related activities, including knowingly leasing, renting, maintaining, managing or controlling a place where marijuana is grown, transformed or sold. Notwithstanding the increased risk of federal criminal prosecution, the de-facto shield of favorable state laws has enabled cannabis-related facilities to continue to emerge from the shadows. Industrial premises used for indoor cultivation and transformation are seemingly as state-of-the art as those found in the more traditional, similarly highly regulated pharma industry. Retail dispensaries are no longer relegated to dilapidated buildings in fringe locations. To strike the right balance between the enormous opportunities this industry represents for landlords and tenants and the risks of owning, leasing and occupying cannabis-related real estate, a collaborative landlord/tenant approach to strict regulatory compliance and conflicting real estate needs is key. That way, neither party gets stuck with the whole bill but none of the benefits. As we head into the dog days of summer, the importance of keeping everyone’s foot on the gas pedal during commercial lease negotiations is magnified, given the tempting distractions of summer. Adhering to this ‘urgency mandate’ is one of our key Black Box strategies for getting retail, office and industrial leases over the finish line. Following up on our April Back to Black blog post, this month we take a deeper dive into the underpinnings of the legal process of commercial leasing for the landlords, tenants, brokers and lenders whose real estate fortunes are tied to its success. Our focus today is on the precision vs urgency axis: the conflict between the need to get everything right and the reality that time kills deals. To effectively traverse this axis, the starting point for me with every new client is to earn the right to move fast. By demonstrating command over the details and nuances of the transaction at hand in a way that transcends that particular transaction, I make sure that my client gains a strong level of comfort that they made the right choice of attorneys. Simultaneously I find out where my client’s focal point is on the urgency/precision continuum generally and specifically for the lease we are working on. As this client articulated, no matter where a client stands on the precision vs urgency axis, every client needs to know they have an acceptable amount of precision insurance. And no lawyer worth their salt would ever finalize a document they knew to be sloppy, wrong or ambiguous. During lease negotiations, I actively manage two aspects of the precision goal. The first is expressing each concept in the lease with clarity so someone else can understand it, both today and ten years from now. The second is coherence: making sure all the provisions work together. For example, if the landlord’s work can’t be performed until the tenant’s plans are complete, other provisions of the lease that need to come together to trigger the all-important obligation to commence rent payments have to be coordinated accordingly. At a certain point in every transaction, urgency trumps precision. Managing this tension with the endgame in sight is one way we make sure the process doesn't jeopardize the outcome. And that’s part of our strategy for creating value as we toil away in the black box. As the real estate industry braces for what is likely to be a challenging point in the boom/bust cycle, getting each commercial lease over the finish line takes on greater importance and requires greater finesse. As each lease we work on presents unique challenges shaped by the current real estate climate, we’ve found that our Black Box strategies for minimizing the time, cost and risk of the legal leasing process are more important than ever. We originally published our Black Box series in late 2014 and early 2015, and think this is a good time to revisit it. Here is our introduction to the Black Box. For most real estate professionals, the legal leasing process is a black box. Once the brokers and principals agree to a few salient business terms, the lease disappears into that black box and there is little understanding of exactly what the process is, let alone how to successfully manage it. The legal process of commercial leasing can, at its most basic level, be summed up by imagining two intersecting axes of conflict that the attorneys need to traverse as they move toward the finish line (see illustration above). The first axis represents the conflict between precision and urgency. The need for precision can be likened to the need for adequate insurance. The hope is that you’ll never need to depend on it, but boy if you do, having it is essential. 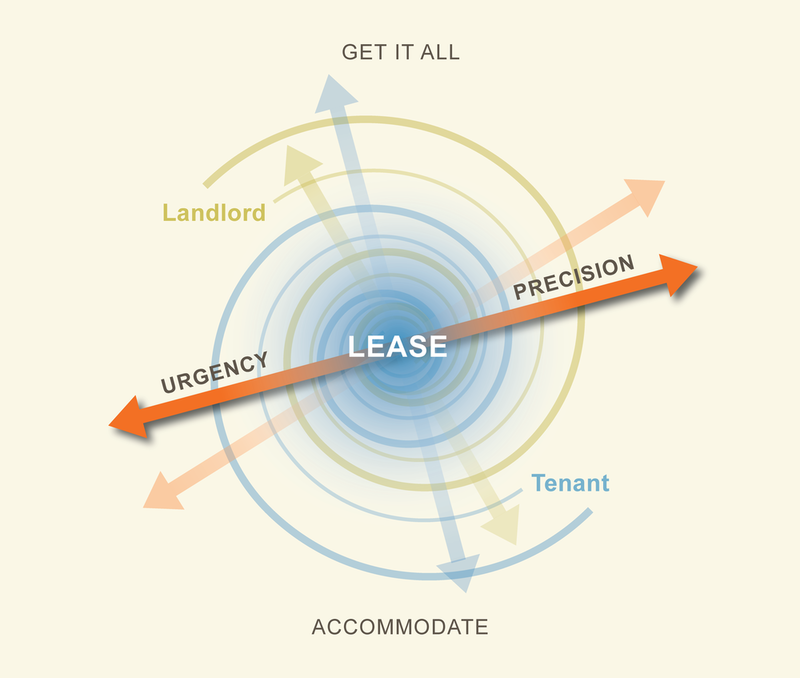 The conflicting tension at the other end of this axis is the urgency to get the lease signed. This stems from the reality that time kills deals and the longer your lease lingers in the black box, the more likely it is that the other party will be distracted by a cute new puppy or the shiny penny over there that will trump the lease in the box. The second axis represents the conflict between the desire to get it all, or go for the jugular, and the need to accommodate the other side and pursue win-win solutions. At a certain point in every transaction, urgency trumps precision, and the need to accommodate trumps the desire to get it all. But there is an infinite number of paths to that all-important point, and figuring out the most direct one is often tricky. In addition, knowing you’ve arrived at that point can be elusive and requires an intuitive sixth sense even the most experienced attorneys don’t always have. The result is often a process that takes too long, costs too much and jeopardizes the outcome. In September 2015, when we published our first In the Weed(s) post about cannabis-related real estate, medical marijuana had been legalized in 10 states (plus D.C.), five of which had also legalized it for recreational use. Fast forward to today, and 29 states (plus D.C.) have enacted laws legalizing marijuana. In each of these jurisdictions, real estate is a necessary common denominator for cannabis cultivation, transformation and retail distribution, currently a $7B industry. Bloomberg Markets estimates that number will be a $50B by 2026. If you're thinking this would be a great value creation opportunity for your property, keep in mind what hasn't changed since 2015: the use, possession, cultivation and transportation of marijuana is illegal under federal law, along with a wide range of related activities, including knowingly leasing, renting, maintaining, managing or controlling a place where marijuana is grown, transformed or sold. Notwithstanding the lingering risk of federal criminal prosecution, the shield of favorable state laws has enabled cannabis-related facilities to emerge from the shadows. Industrial premises used for indoor cultivation and transformation are seemingly as 'state-of-the art' as those found in the more traditional, similarly highly regulated pharma industry. 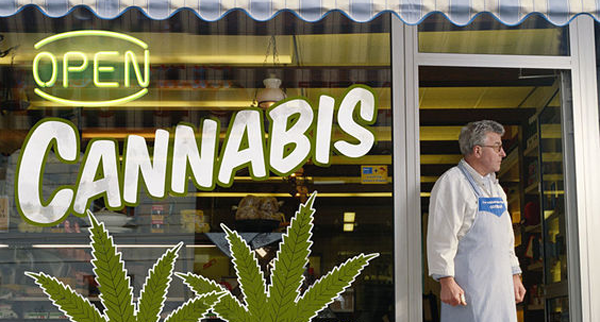 Retail dispensaries are no longer relegated to dilapidated buildings in fringe locations. Spring is (finally) in the air and it's a great time to evaluate what your company stands to gain by taking advantage of the fresh perspective new leasing counsel can provide. Here are three ways that working with a new attorney can save you time and money and reduce the risk of not getting your commercial leases over the finish line. Is Your Form Lease a Dinosaur? Do you know if your form lease is one of those dinosaurs that slows down every lease negotiation? One of our clients used its time-worn form for years until we made them aware that not only was it ridiculously one-sided, it was also outdated and internally inconsistent. Cleaning it up required overcoming strenuous internal resistance, but resulted in quicker, easier lease negotiations. Are Negotiations Getting Bogged Down? How long has it been since you've reviewed your standard negotiating positions? If your company's stance on issues such as casualty restoration and insurance coverage trigger long, drawn-out deliberations, that's a wake-up call for a thorough re-evaluation. When we took over the legal leasing work for a suburban office building in New Jersey, we worked closely with the leasing team to update and standardize the landlord's bottom line on non-deal-specific issues. Within 36 months, the property reached full occupancy. How Capable Is Your Team? When is the last time you took a hard look at the real capabilities of your leasing team? Do you know if your leasing reps are skilled deal-makers? Are your construction, property management, and accounting departments responsive and accurate when providing support to the leasing team? In one recent case, a client brought us in to negotiate a retail anchor lease, replacing its long-standing retail attorney. During the negotiation, we helped this client recognize that its broker was jeopardizing the deal before there was a fatal blow. With the help of a new broker, the lease was signed and the tenant is about to open for business. As we move further into the new year, change is palpably in the air. The inclination to cling to what's comfortable and familiar is being challenged locally, nationally and globally. From our vantage point on the front lines of the legal leasing process, challenging what's comfortable and familiar is a great way to get rid of what's not working, and improve everything else. In opening the Black Box of the legal leasing process we’ve brought transparency to many time-worn, counter-productive habits, including use of the dinosaur form lease, negotiating outside the sphere of reasonableness, and the tendency to ignore the urgency mandate that time kills deals. Underlying the seemingly irrational adherence to these and other practices is the addictive draw of comfortable old shoes and the devil you know, i.e., the insistence of most commercial landlords and tenants on using the same leasing counsel they've always used, whether it be in-house counsel, outside counsel, or a combination of the two. Blind to the hazards of not trying someone new every so often to shake things up and see first hand what they may be missing out on, most companies continue to plod along and instead, vent their frustration over the time, cost and risk of getting leases over the finish line. In addition to using the same counsel year after year, for better or worse, most commercial landlords and tenants have not developed metrics by which the performance of counsel can be measured, managed, and continuously improved. Do you know if your leasing counsel is providing ‘best-in-class’ legal services? What metrics do you use to measure this? What procedures do you have in place for selecting new counsel? If you can’t answer these questions, you probably don't really know if your form lease is hurting or helping you, or if your lease negotiations are consistently efficient and effective, or whether (or not) your leasing teams remain vigilant as the lease nears the finish line. Having just witnessed one of the most important transitions in U.S. and world history with the 2016 Presidential election, and having just returned from Dallas and Fort Lauderdale where thousands of real estate professionals and I participated in the Urban Land Institute (ULI) Fall Meeting and the International Council of Shopping Centers (ICSC) Law Conference, I’m focused on making sense of it all. My take away from the election results is that no matter what side of the aisle you’re on, this election is a call to action. Change is in the air, and each of us has a role to play. This also applies to the real estate industry and the legal leasing process. Technology, the sharing economy and even the expanding legalization of marijuana are contributing to a dizzying evolution of residential, retail, industrial and office spaces. Distinguishing factors between these property types are shifting and blurring. As a result, landlords, tenants (and their attorneys) need to be considering and communicating about new ways to define and evaluate their long term relationships and the properties that bring them together. At the recent ICSC Law Conference, I spoke with the general counsel of a public REIT that owns regional malls throughout the country. He pointed out that retail landlords and tenants are missing the point when they value retail stores based on in-store sales, even if they expand what is considered an in-store sale to include online sales that touch the store (e.g., where merchandise ordered online is picked up at the store). The more important point is that to accurately measure the value of retail properties that may also serve as showrooms, warehouses and fulfillment centers, the aggregate value of all of the store’s uses is a far better metric to use. The technical ramifications of using this broader metric to assess valuation must then be addressed during the legal leasing process. There’s no one right answer to these questions of first impression for those of us toiling away in the Black Box of the legal leasing process and the landlords and tenants we serve. But if we don’t start thinking like the change agents that we need to be, we'll be stuck a status quo that doesn’t serve us or our clients, akin to the one that so many American voters strikingly rejected. As the 2016 presidential race picks up steam, we are moving full speed ahead to make sure our clients meet their first quarter leasing goals. We love the quickening pace and thought this would be a great time to share some of our Moments of Truth strategies for minimizing the time, cost and risk of getting commercial leases over the finish line. Today we explore curve balls, our term to describe situations that arise without warning in the Black Box of the legal leasing process. Depending on how they’re managed, these can accelerate, delay or kill the deal. Although it’s not possible to prepare ahead of time for curve balls, we’ve figured out how to be ready when they come to light, so the deal accelerates rather than slows down or dies. Here are some examples of recent curve balls that threatened leases just as we were finalizing them: a pet store lease my client, the landlord, realized was not permitted in the shopping center pursuant to the terms of an existing anchor lease; a restaurant lease for a franchisee/tenant who had not “remembered” to provide the landlord with the franchisor’s lease requirements; a health club lease for a tenant whose water/sewer requirements could be restricted by an impending sewer moratorium in the local jurisdiction. Ever vigilant, we saw these curve balls materialize, and reached into our handy-dandy strategy toolkit, mobilizing a collective effort to move the lease over the finish line. Step 1. We worked very closely with our client to devise and execute a winning plan of action. Step 2. We took full advantage of the good working relationships we developed with the attorney and principal on the other side, and made sure everyone was focused and in action. Step 3. We kept everyone informed about the nuances and tenor of the negotiations as we made progress. Step 4. We never lost sight of the fact that time kills deals, no matter where we are in the process. Fall, the season when things speed up, is upon us. Our clients are focused on year-end deadlines and we’re focused on meeting those deadlines. Given the pressure most of us are under to wrap things up by year’s end, I thought this would be a good time to share some of my strategies for making sure that what happens in the Black Box of the legal leasing process doesn’t hold things up. As we make our way through the Black Box, there are pivotal points when lease negotiations can stall, fall apart or move full speed ahead, depending on how adeptly Black Box maneuvers are handled. I refer to these pivotal points as Moments of Truth and I have a variety of strategies for managing them. The first Moment of Truth that comes up in every transaction is Setting the Tone. This happens early in the Black Box process, and, for better or worse, can color the balance of the negotiation. If the tone set is unproductive or intransigent, the lease in the Black Box will be at risk. If that happens it’s essential that one or both attorneys (or their clients) recognize that a re-set is necessary. For example, in a recent lease transaction between a large public REIT and a national retailer, the parties exchanged lease drafts that bore little resemblance to the deal agreed to by their leasing representatives, thus setting the tone for a tedious, unproductive negotiation. Luckily the REIT recognized the need for a re-set and brought me in to do just that. I revised the tenant’s lease draft to reflect the agreed-upon deal, which enabled the negotiation to move productively toward a final lease. In another lease negotiation that required a re-set, I represented the owner of a suburban office building where a small tenant hired a large, prestigious law firm to handle its lease negotiation. Its attorney marked up the landlord’s form lease as if the small firm was an anchor tenant negotiating its headquarters lease. This time, I recognized that the tenant’s attorney was tone-deaf and enlisted my client, the building owner, to re-set the tone with her counterpart, the tenant’s president. After that, we were down to just a handful of issues rather than the exhaustive re-draft that had been looming. Over the coming months, I will share my strategies for handling other Moments of Truth so that negotiations accelerate rather than stall at pivotal points. As time marches on, the inevitability of change is a constant reality for all of us in the real estate industry. In past blog posts, including our recent July 2015 Game Changers issue, we've highlighted how the built environment is evolving in response to changing demographics, technology, sustainability and a whole host of other factors. For every asset type, from residential to industrial, value is inextricably linked to staying relevant. We believe that the lease — which governs how tenant-occupied, income-producing property is used, operated, maintained and renovated — significantly influences the rate at which the underlying property can evolve and stay relevant, or not. As a result, we envision that the ideal lease of 2020 is one that anticipates, encourages and facilitates changes over the lease term that will optimize the value of the subject property in ways that traditional lease structures do not. Getting to this ideal lease will be tricky. Most efforts to step away from traditional lease structures are met with great resistance and those traditional structures often incorporate a delicate and hard-fought balance between control and certainty on one hand, and flexibility and innovation on the other. However, there is a precedent for advancing into new leasehold territory in order to facilitate innovation and value creation that I believe holds the key to developing the ideal 2020 lease. It is often referred to as an Energy Aligned Green Lease. The Energy Aligned Green Lease emerged from the realization that traditional lease structures disincentivize landlords from making energy efficiency improvements to their properties. To correct this, a New York City task force of real estate professionals was convened by Mayor Bloomberg as part of New York City’s PlaNYC. The fruit of their efforts, a provision that requires the tenant to contribute to the costs of future qualifying energy efficiency improvements at a rate that makes it financially palatable for the landlord to make these improvements, is the crux of an Energy Aligned Green Lease. The details governing this requirement on the tenant's part coalesce into a significant departure from a traditional lease, whether it be a triple net, gross or modified gross lease; and in the details, lie the differences that make the difference between inaction on the landlord's part and taking action to improve the property and thus add value. For sure, challenges still abound, including the challenge of getting landlords, tenants and their attorneys to incorporate this and other "new" structures into their leases. As the pace of change accelerates, the need for building greater flexibility into leases will increase. I believe the Energy Aligned Green Lease is a potent example of a 2020 approach to leasing that incorporates the flexibility necessary to facilitate asset value optimization. Now we just have to use it. In our recent Black Box Series of posts, we exposed what the legal process of commercial leasing is: a balancing act along two intersecting axes of conflict that ultimately results in a finalized lease. Understanding what goes on in the black box is just the beginning when it comes to creating a world-class process for getting leasing transactions done as quickly and cost-effectively as possible, a goal all of our clients share. Unfortunately most real estate professionals don’t have a methodology for measuring the legal leasing process. Although they all want it done with greater speed and less cost, given the reality that “if you don’t measure it, you can't manage it,” most commercial landlords and tenants find it frustratingly difficult to improve. Going beyond our role as leasing attorneys, we saw an opportunity to partner with our clients by tackling this issue. The result is our 360 Lease Review, an out-of-the-box methodology for quantitatively (and qualitatively) evaluating the legal process of commercial leasing before and after every leasing transaction, so the process can be meaningfully and continuously improved. Here’s a look at how we developed the 360 Lease Review. Essentially the 360 Lease Review is a business improvement tool designed to be consistently applied to the business of commercial leasing in order to continuously improve it. In developing the 360 Lease Review, the first step was untangling the legal leasing process. We broke the process open into a series of conflicting and interlocking factors that we described in our recent Black Box Series. Next we identified the raw materials that go into the black box, including such things as the letter of intent, the form lease, and ongoing client support, and we developed a methodology for scoring each ingredient and how it impacts each performance factor. For example, a letter of intent that accurately covers 90% of the issues that are important to the transaction will positively impact black box performance in three very important ways: first, it will improve performance on the desire to get it all vs need to accommodate axis; second, it will accelerate the process, contributing to a high urgency mandate score; and third, it will facilitate a greater level of accuracy in the final document, contributing to a high precision insurance score. The resulting 360 Lease Review for each lease is a series of these and other scores that are weighted in terms of importance, as well as a narrative evaluation, that roll up into a final score that corresponds to how quick and cost-effective the legal leasing process was for that lease. The scores from each lease review are also quantitative data points that can be compared from lease to lease to identify positive and negative trends, thus enabling real estate professionals to diagnose what parts of the transformation process need to be fixed and which raw materials need to be enhanced in order to consistently improve their legal leasing process until it is second to none. Stay tuned for a deeper dive into each of these steps. Our black box series on the legal leasing process concludes this month with part three of our secret sauce for managing what goes on during that often-dreaded and little-understood process. This month we bring our focus to the red zone: that point in the negotiations where just about all the issues have been resolved and the lease is almost in final form. Close to the goal line, but not quite there yet. Just as a questionable call in the red zone had disastrous consequences for the Seattle Seahawks in this year's Super Bowl, poor management of the legal leasing process when the lease is just about finalized can also have radical implications. When lease negotiations reach the red zone, I rely on a heightened level of vigilance to make sure the lease makes it to the goal line and gets signed. I know that if I let down my guard or take my eye off the ball, what looks like a win can easily turn into a loss. Here are some examples of what can and has happened in the red zone: the tenant is a franchisee and “remembers” that the landlord needs to enter into an agreement giving the franchisor rights under the lease that could derail the deal; the bank issuing the letter of credit that will serve as a security deposit finally produces a draft that the landlord won't accept; the local jurisdiction issues restrictions that could have serious implications for the tenant’s permitted use. Time for everyone to mobilize to bring the lease into the end zone. Here are the strategies that we rely on to get there. The first strategy is teamwork: we take full advantage of the good working relationship we’ve developed with the attorney and principal on the other side and make sure everyone is focused and in action. The second strategy is coaching: we work very closely with our client to devise and execute a winning plan of action. The third strategy is communication: we make sure everyone is informed about the nuances and tenor of the negotiations as we make our way forward. The fourth strategy is speed: we never lose sight of the fact that time kills deals, especially when they’re in the red zone. As leasing traction continues to accelerate, our black box series on the legal process of commercial leasing continues with part two of our secret sauce for managing what goes on during that often-dreaded and little-understood process. Last month we focused on the precision vs urgency axis and how we balance the need for precision insurance against the reality that time kills deals. This month our focus shifts to managing the simultaneous conflict on the other axis between each party’s desire to get it all and the need to accommodate the other side so that a meeting of the minds can be achieved. In order to successfully traverse this axis, we start by scoping out the boundaries within which meaningful negotiations can take place, a zone of reasonableness, so to speak. Negotiating outside the zone is largely a waste of time and money. For example, it would not make sense for a 2,000 square foot tenant to try to modify the condemnation clause in a New York City Class A office building lease, but it could make sense in the case of a 300,000 square foot tenant. The size of the zone of reasonableness, which can range from a pinhole (one or both parties insist on getting it all) to an ocean (both parties are willing to accommodate), will be based on the relative bargaining power of the parties and influenced by a variety of other factors including timing, personalities and relationships. Once I understand the boundaries of the zone, no matter how lopsided the parties’ relative bargaining power is or which party I represent, I can operate from a position of strength to guide the negotiation to a point on this axis that represents a meeting of the minds. In my opinion, and it doesn’t matter whether I represent the 900 pound gorilla or the 90 pound weakling, that point should represent a ‘win-win’ for both parties. After all, the success of the legal leasing process is not just getting to the finish line, it’s also about forging a viable long-term relationship between landlord and tenant. As I noted in December, at a certain point in every transaction, the need to accommodate the other side trumps the desire to get it all. Managing this tension with the parties’ long- and short-term goals in mind is another part of our strategy for creating value as we toil away in the black box. Stay tuned next month as we pull the axes together, and call us today to negotiate your leases. You can’t afford not to. Last month we opened up the black box that constitutes the legal process of commercial leasing and received an overwhelmingly positive response from many of the landlords, tenants, brokers and lenders whose real estate fortunes are tied to the commercial leasing process. This month, we continue the black box series with part one of an exposé on our secret sauce for managing what goes on in there. During lease negotiations, I actively manage two aspects of the precision goal. The first is expressing each concept in the lease with clarity so someone else can understand it, both today and ten years from now. The second is coherence: making sure all the provisions work together. For example, if the landlord's work can’t be performed until the tenant’s plans are complete, other provisions of the lease that need to come together to trigger the all-important obligation to commence rent payments have to be coordinated accordingly. As I noted last month, at a certain point in every transaction, urgency trumps precision. Managing this tension with the endgame in sight is one way we make sure the process doesn’t jeopardize the outcome. And that’s part of our strategy for creating value as we toil away in the black box. Next month we’ll take a deeper dive into the second axis of conflict: the desire to get it all vs the need to accommodate the other side. Last week I spent two amazing days with over nine thousand commercial landlords, tenants, brokers and lenders at the International Council of Shopping Centers (ICSC) New York Deal Making Conference here in New York City. There are not many other gatherings of this size (or any size really) where practically everyone's financial well-being is inextricably linked to the occasionally welcomed, but most often dreaded, legal process of negotiating a commercial lease. At the conference, elements of this process were discussed repeatedly and those conversations confirmed my suspicion that for many professionals in the real estate industry, the legal leasing process is a black box. Once the brokers and principals agree to a few salient business terms, the lease disappears into that black box and there is little understanding of exactly what the process is, let alone how to successfully manage it. So in this post I am going to open up that black box — the legal process of commercial leasing — and in the next two posts I am going to share my secret sauce for managing it. The first axis represents the conflict between precision and urgency. The need for precision can be likened to the need for adequate insurance. The hope is that you'll never need to depend on it, but boy if you do, having it is essential. At a certain point in every transaction, urgency trumps precision and the need to accommodate trumps the desire to get it all. But there are an infinite number of paths to that all-important point and figuring out the most direct one is often tricky. In addition, knowing you've arrived at that point can be elusive and requires an intuitive sixth sense that even the most experienced attorneys don't always have. The result is often a process that takes too long, costs too much and jeopardizes the outcome. Stay tuned as I dig deeper into the black box and share how we traverse those axes of conflict to create value for our clients.